Inspired by the true story of Carl Brashear, the first African American master diver in the United States Navy, Men Of Honor is a respectable effort with quality performances, but doesn't fully escape the trap of sanctifying its hero. 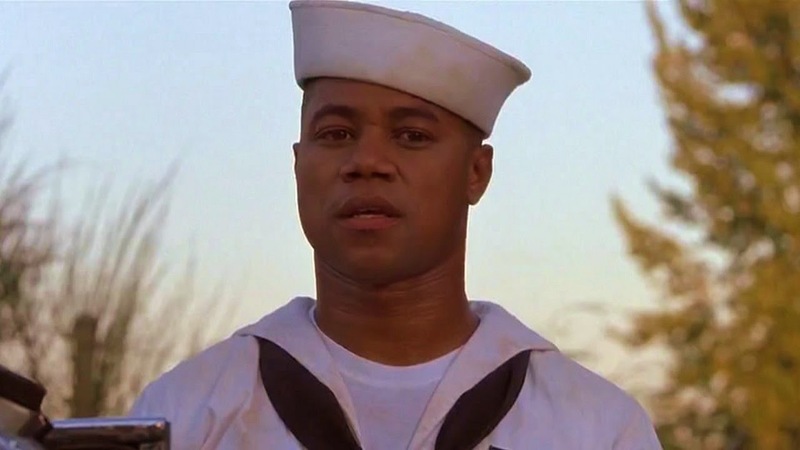 Born and raised in Kentucky and heavily influenced by his noble father Mac (Carl Lumbly), Carl Brashear (Cuba Gooding Jr.) leaves the life of a sharecropper and joins the Navy in 1948. Assigned the menial task of ship's cook similar to all other enlisted colored men, Carl refuses to conform or yield to racism and catches the eye of Captain Pullman (Powers Boothe), who re-assigns him as a seaman. But it is the heroism and determination of Master Chief diver Leslie Sunday (Robert De Niro) that inspires Carl, and he sets his sights on becoming the Navy's first black Master Chief diver. Meanwhile, a case of over-enthusiasm harms Sunday's lungs and ends his career as an active diver. After numerous attempts Carl is accepted into the Diving and Salvage School in New Jersey. With Sunday as his instructor, Carl encounters rampant racism from the other trainees, as well as the base commander Pappy (Hal Holbrook). But he doggedly overcomes all hurdles and strives to complete the program, grudgingly earning the respect of Sunday. But just when Carl thinks that he has achieved his lifelong dream, he suffers another devastating blow that threatens all that he has worked for. Tidily directed by George Tillman Jr., Men Of Honor is a straightforward story of uncommon persistence in the face of adversity. Because he is black, Carl he has to work three times as hard and show remarkable restraint to reach his goals, and his story is one of patience and remarkable tenacity. He is presented as a faultless man, rarely setting a foot wrong and never saying a bad word. Carl's singular focus is on achieving his career goal, and he will do whatever is asked of him to get there. His mission becomes a case of indestructible resolve forcing everyone else to finally concede the obvious: a black man can be as good as, if not better, than a white man. Remarkably, in the prime of his career Carl faces another form of discrimination, and has to fight yet another battle for his rights in the face of rampant disbelief from the Navy hierarchy. As with many biographies, real life represents the film's strength and its weakness. History dictates that Carl will overcome every obstacle placed in his way, and admirable as the story is, it is also by default stripped of any overarching drama. The narrative becomes one of chronicling successive victories over many acts of individual and systemic discrimination, but it's a linear structure devoid of surprises or depth, and many of the most dramatic moments carry hints of being contrived. In addition to Holbrook and Boothe, there are small roles for Michael Rapaport as another trainee and Aunjanue Ellis as a medical student who becomes Brashear's tutor, girlfriend and then wife. Charlize Theron contributes a rather bewildering turn as Sunday's too-flashy wife. 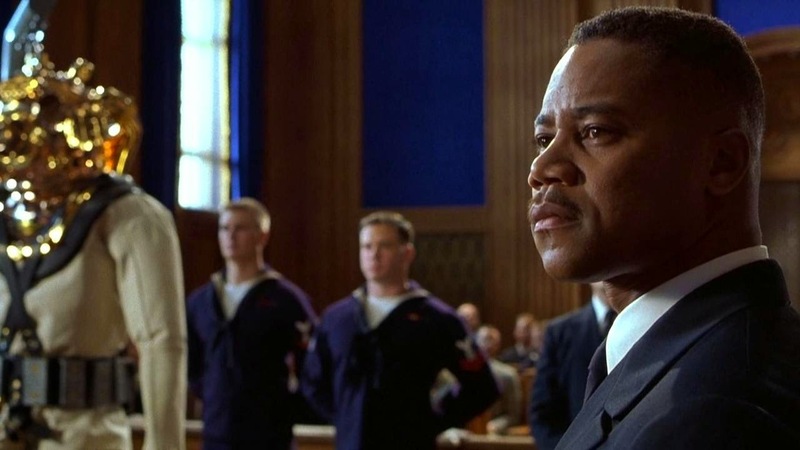 Men Of Honor is a tribute to an impressive man who broke down racial barriers. The film may not reach dramatic heights of cinematic achievement, but it is brimming with heart and good intentions.